At today’s Council you will be presented with proposals for the Professional Services Review. 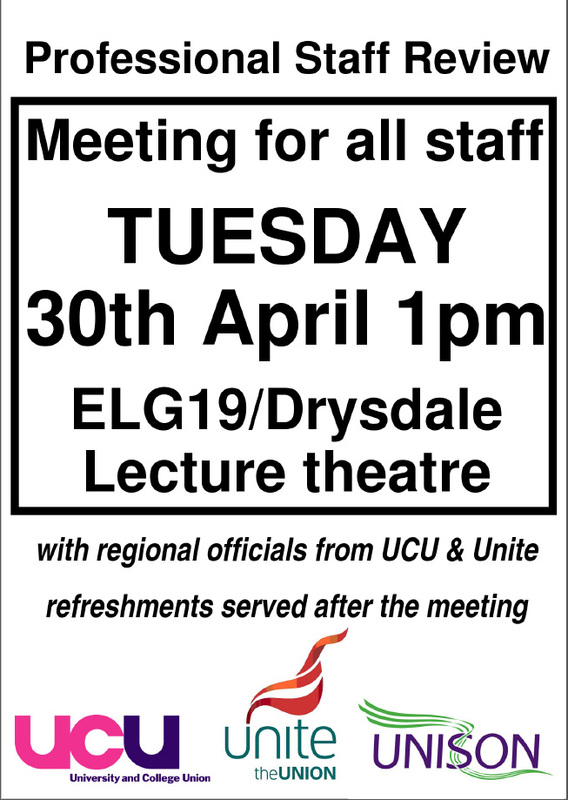 We do not know what is in these papers but we believe that the proposals will lead to the University entering into formal redundancy consultation that could lead to over 100 non academic staff being made redundant. At the same time pursuit of the University’s vision has seen the recruitment of over 100 academic staff geared to the 2014 REF. It is our understanding that to pay for these staff, existing loyal academic staff are to be forced out by a variety of means including the setting of unrealistic performance targets and the inappropriate use of capability procedures. In spite of an excellent Occupational Health team levels of stress amongst staff appear to be at their highest. The 2011 Staff Survey showed an unhappy workplace and one that felt that Management failed to effectively communicate with them. We will be approaching the 2013 Survey with no tangible improvement. 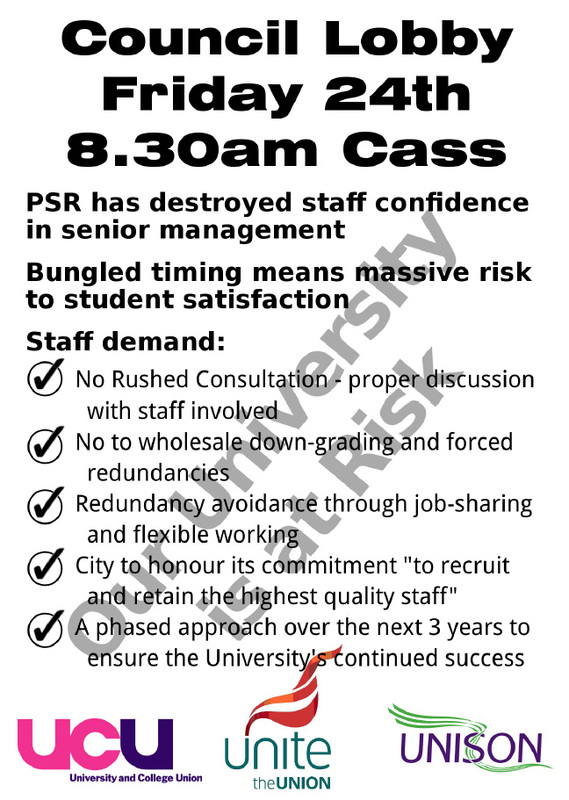 The University fails to consult with staff in any effective way. The trade unions are only reluctantly involved in any discussions and the norm is only when it is too late and decisions are already set in stone and the management have decided that there needs to be redundancies. Many, many staff at all levels have serious doubts about some aspects of the Vision and Strategy and certainly the majority about the speed of change. Slavish adherence for City University to one set of league tables is unhelpful especially with its proud and already proven record as the University for Business and the Professions. A University based on employability for its student and practical training for those entering professions in medicine, law, journalism and business is much more than a centre of research excellence. At last night’s Council dinner and today’s Council meeting you will be served by contracted-out staff who are paid well below the London Living Wage. The same goes for the staff that cleaned the rooms you are using. The trade unions recognise that these are difficult times for all in the HE sector but we believe there is a better way forward. Unless there is a change of approach the University is about to be faced with the most bitter period of employment relations in its history. We hope you do not want to be the Council that oversees this. We therefore ask that the speed of change at the University is slowed. 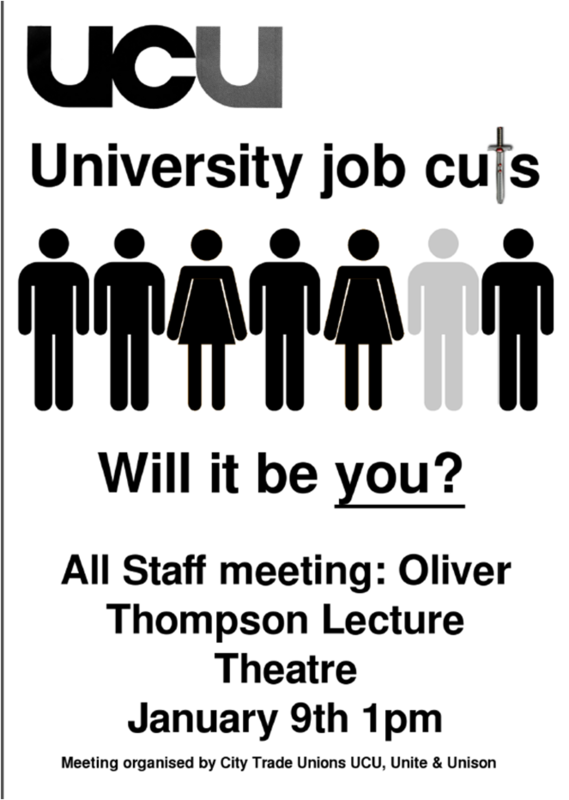 That the University engages with its staff and there is a real debate over what City University is all about. That consultation is embraced and staff and students be allowed to input into the future direction. In terms of the impending reorganisation of the Professional Services the trade unions have already submitted proposals on a Managing Organisational Change Policy and Enhancing Job Security/ Avoiding Redundancy. To date we have had no real response. We ask that the University commit to no compulsory redundancies in 2013 and enter into meaningful discussions to seek ways of avoiding redundancy and improving staff morale at a time when we all need to be united to ensure City University, London has a prosperous and successful future.